Get 2x more website conversions. 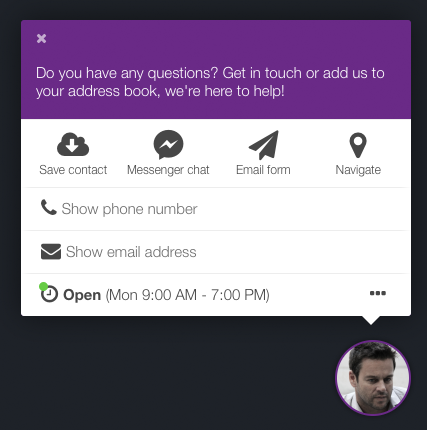 HelloBox adds a slick multi-channel contact widget to every single page of your website. Instant & secure. Easy set-up. Suitable for any website. Want to learn more? Click here to see our video introduction! Talk to your customers via chat, email, voice, messaging apps, text or face to face. Different people prefer different communication channels. Customers can contact you using their favorite channel & device. Allow people to easily save your contact details to their digital address book to get in touch at a later time. Stylish design-templates and badge icons. Custom widget triggers (e.g. exit-intent, scroll, click, etc.). Catch a site visitor's attention with the HelloBox badge & welcome message. Business hours, including realtime open/closed status. Spam protection: Email addresses and phone numbers are obfuscated (hidden) from bots, while keeping them visible to humans. Pentatonic provide many communication channels to their site visitors and let them pick and choose the medium they want. This way, customers have higher satisfaction levels, and this, in turn, directly contributes to higher conversions. Over 50% of website traffic is now coming via mobile devices, at the same time statiistics show that mobile attention span is extremely short. HelloBox converts more mobile visitors into customers by making it easier for them to instantly get the help they want and need, in a fun and visual way. Accessible, highly visual contact options = more website conversions! Easy contact import: Allow people to instantly add you to their smartphone contacts without typing. Help people to find you: Your business address will be opened on Google Maps for easy navigation. From any place of your website. Instant messaging: Allows visitors to quickly send you a message using sms, email, WhatsApp or Facebook Messenger. All HelloBox email messages are delivered by Postmark, the industries fastest and most reliable email delivery. Servers powered by Hetzner in Germany, using green energy from 100% carbon dioxide-free and environmentally-friendly hydropower. HelloBox is a PixelHub project. Check out our main page for legal and privacy information.